The Red Sox-Yankees rivalry hasn’t been particularly contentious for a while, with the last waypoint being that time Boston called out Michael Pineda for the obvious pine tar on his hand. Maybe a good sign-stealing feud will bring it back. That’s what makes this such a gloriously stupid and perfect baseball scandal—the actual act of stealing signs isn’t illegal (though it is frowned upon), but using technology is. The video provided to the commissioner’s office by the Yankees was captured during the first two games of the series and included at least three clips. In the clips, the team’s assistant athletic trainer, Jon Jochim, is seen looking at his Apple Watch and then passing information to outfielder Brock Holt and second baseman Dustin Pedroia, who was injured at the time but in uniform. In one instance, Pedroia is then seen passing the information to Young. 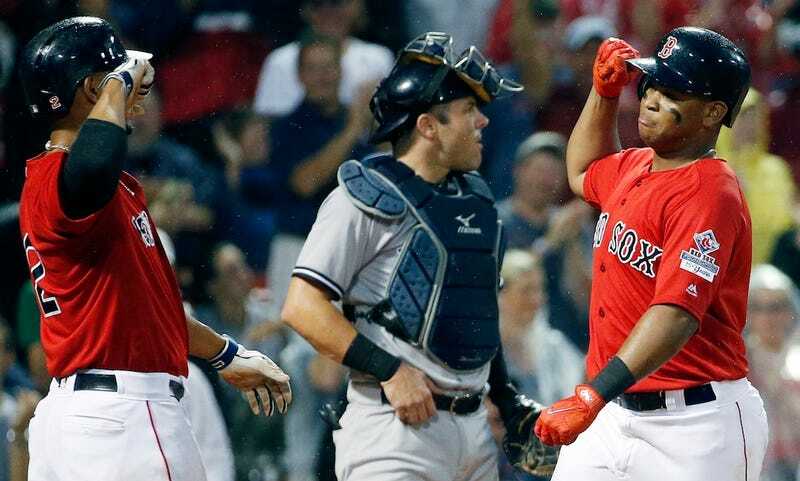 Also considered evidence in the Yankees’ eyes is that Rafael Devers and the Red Sox went 5-for-8 in the first game of the series with a man on second. In the second and third game, Boston was 1-for-6 and 3-for-10, respectively.